The activities involved in selling yourself can begin before your book is released. Get your name out there as soon as possible so that when your book is published you will appear to be well-established. If you already have books on the market, read on because it is never too late to build interest in you and your products. I began a blog called The Christian Bookmobile five months before my first book was published. During that time, I posted articles about why I wrote the book as well as some of the mechanics of self-publishing. At one point, I let readers vote for the cover they liked best. By the time the book was available for purchase, I had written and posted 85 articles. However, there's no magic number. Do as many as you can, though. It takes time to build a following. Blogging is just one way to sell yourself. We'll also talk about building a website, using social media, joining groups, and other ways to get your name out for potential buyers to see. Not everyone will want both a website and a blog so read the section on blogs before deciding. The ultimate purpose for an author website is to reach book buyers, entice them to buy your books, and recommend your publications to all their friends. Here are some of the pages you'll find on the typical author website. Home—this is where the reader begins if he or she types in your domain name. My domain name is sidneywfrost.com. The city of Georgetown's domain name is Georgetown.org. The Internal Revenue Service uses irs.gov. However, don't forget someone may reach one of your other pages first if they access your site as the result of a search. In addition to entering your site, you may sometimes direct them to a special place called a landing page during a marketing promotion. So, make your website easy to navigate. Each page in your website should include a simple way to get to the other pages. Bio—This page, sometimes called Profile, Author, About, or whatever you like, often contains a recent photo and a biography slanted for your writing career. If you have worked in other areas besides what you write about, only include information that is pertinent. Since I write Christian stories that involve a bookmobile in one way or another I mention my experience as a Stephen Minister and the fact that I was a bookmobile driver at one time. The main character in my Vengeance Squad stories is a computer science professor, so I include the fact that I taught computer science for many years. Books—Although you can highlight your books on the home page, there should be another page with more information about each book. This page could include purchasing information as well as buy links. You may want to sign up with Amazon as an associate and earn commissions when people buy from your website. Events—This page is sometimes called Appearances or Calendar. It should include the date and time you will be at a book signing or doing a talk. Leave in those that have already occurred to show your activity. I include events such as being a guest on a blog. Contacts—This page could contain a fill-in-blank form to make it easy for the reader to send you a message without knowing your e-mail address. Or, you could list the various ways a reader could contact you. Examples include Facebook, Twitter, Pinterest, e-mail, etc. Blog—This is a place where you post short articles periodically along with any other information you want to convey. You may choose to have a separate blog site. See a complete description of blogs below. Media—Some authors include information for the news media. Various-sized photos of author and book covers, expanded bios and press releases, for example. I'm not sure these are necessary for most authors. Although not found on all author websites, I also include a Specials section because I think everyone is interested in a deal. This is where I show books that are free and discounted, or are scheduled to be soon. Check these websites, or those of your favorite authors, to get ideas for your own. Find other sites to study, especially the websites of authors of books like yours. It can be costly to hire someone to create a website for you. In keeping with our goal of not spending more for advertising than we can make from sales, you will probably need to look for a cheaper way to build a web presence. In the section titled "Blogs", you will see that a free blog can do most everything a website can do. This means you may only need a blog. I like to have both. Therefore, I look for ways to do so without spending tons of money. I recommend Weebly.com. Even though I have a master's degree in computer science and am experienced in building websites, I didn't want to take the time required to build one from scratch that could be easily and quickly updated. Instead, I looked around for solutions and ended up with Weebly. They offer various levels of service beginning with one that is free. I signed up for the pro plan since it included some features I wanted, and by paying for three years, I could get the service for less than what Yahoo charged for a place to put my previous website. The only complaint I have about Weebly so far is that they are slow responding to questions. When I have more experience, I will blog about it. By the time you read this, there could be a better service available. Do your research and don't spend more than you make. For an example of a website created in less than an hour, see http://sidneywfrost.com. Another way to sell yourself is with a blog. Blog is short for weblog, a way to provide discussions or information on the worldwide web. As we saw above, a blog could be included as a page within a website. Often, however, authors use one of the free blog services. Two popular ones are Google's Blogger and WordPress. I've tried both and only recently settled on Blogger. There are many useful features on WordPress, but I wanted all my blogs on the same service and most of the people I worked with used Blogger. Before deciding, check them both. Plus, see if there are others available. If possible, start your blog before you publish your book so that by the time your book is out your blog will make you look like you've been around for a while. My blog, the Christian Bookmobile, has more than 500 posts and 60,000 pageviews. Successful blogs include posts that keep readers coming back. Your overall goal may be to sell books, but you can't do that without attracting someone to your blog. Don't think about selling. Think about providing a service. An interesting story works. Some useful bit of information. How to do something. Where to find something. A contest with a desirable prize. Statistics show that my blogs get more visitors when I have a giveaway. I'm not sure if all the visitors are potential book buyers, though. Another blog post that draws many viewers is an exclusive interview of a major author. Of all postings, including contests and giveaways, the one visited most is a book review of Unconditional: A Novel by Eva Marie Everson. It has had more than 6,000 pageviews since it was published in September 2012. Have a way for visitors to sign up, or follow. Some way for them to leave their e-mail address so you can contact them later. Encourage comments. Blogging takes time away from writing the next book, so you will need to decide how much time to spend on blogging. One way to easily increase your blog count and pageviews, both signs of success in blogging, is to join forces with other bloggers. This can be done in several ways. One approach is to join an alliance where you offer to post an article provided to you. I get one once a week and all I have to do is post it. Make sure the content is something your readers will appreciate. Participating in a blog alliance not only increases the number of posts on your blog, it also leads to more viewers. Another way to simplify blogging is to create a blog with other writers who have similar audiences. When you all write articles, you don't have to write as many. And, if you all publicize the blog, you'll reach more people. The third way to increase your blog count and get help directing people to your blog is to open your blog to guest authors. Authors with or without their own blogs may want to post an interview on your blog. But, don't worry, it's not hard work. Many will write the questions and the answers. All you have to do is upload it and post it. You should let the author know when it will be posted so he or she can direct readers to your blog. How many blogs do you need? At least one for each group of readers. Twitter is my favorite way to reach people quickly and perhaps convince some to buy a book. But, tweets are like blog posts in that you must be subtle. First, build up a following of people from your target audience, then keep them following you because your tweets are interesting or useful. A secondary goal is to get them to retweet your tweets to reach a wider audience. If possible, set up a Twitter account before your book is published. This will give you time to gather followers. I see no benefit in buying followers unless a person's goal is merely a high follower count. I only want followers who might buy my books or recommend them to someone else. Building followers is slow. Initially I looked for people with similar tastes for me to follow. My reason was that Twitter makes it easy to follow back. The more people I followed, the more followers I'd get. At least that was what I thought. I currently have 2,500-plus followers and the numbers continue to grow. Follower count goes up and down, so it is a constant effort to get more followers. I cleaned the list of people I follow by removing all corporations, non-profits, and government agencies. That gave me room for more people to follow. People who might follow me back. Now, when I get a new follower, I don't follow back unless they are in my target audience and then only if they have fewer than 2,000 followers. I use Twitter mostly for automated tweets which I schedule to announce book specials. Look at TweetDeck for details. One last comment about Twitter. I've seen some authors create a new Twitter account for each book and others use only one. I think multiple accounts may be needed if your books are for different readers. I only have one, but I can see how multiple accounts might be helpful. I’ve had limited success with Facebook, and have stopped using it to reach readers. I was spending much more for ads than I could possibly make selling books. However, I have found Facebook groups useful. I have one called Christian Writers Support Group. The purpose is to encourage each other by liking and sharing information. Anything you can do to join forces with others will help sales, and increase book reviews. Another way to get your name out there and attract followers is with Pinterest. Pinterest lets you easily create a collection of photos to share. I think everyone enjoys viewing pictures. Sometimes I look through randomly selected Pinterest boards just for the beauty I might find. The nice thing about Pinterest is that the photos can come from the Internet. You don't need permission to use them since the photo will link to the site where you found the photo, giving them credit. There are some places that don't allow sharing of their photos, but Pinterest knows which ones they are, and you won't be able to pin those photos to your board. How can using Pinterest help you as an author? If your book is not yet published, create a board for your future readers. If you're writing a cozy mystery, for example, create a board called "My Favorite Cozy Mysteries." Your photos could be book cover images and you could add a short note about each book and why you selected it. Once your book is published, it would become one of the prominent pins on this board. While writing The Vengeance Squad Goes to England I created a board with photos of locations and items used in the book. As I wrote the book, I added additional photos for each new scene. This served two purposes. First, the images helped me describe the scenes more realistically. Secondly, once the book was published, I included a link to the board, so readers could see photos of the places described in the book. See http://goo.gl/B6UFcX to check it out for yourself. Another prepublication Pinterest board I made was one called Bookmobiles. The reason for this board is that bookmobiles are featured in each of my books. I'm still adding images to it. You may think of a similar use of Pinterest for your books. See http://goo.gl/NEXeZO for the bookmobile board. While you're there, follow me and check out the rest of my boards for other ideas. Goodreads is a place for readers to post their personal libraries. It is an excellent place for an author, publisher, or publicist to visit often. This is where readers hang out and talk about books. There are many opportunities for you to tell members about your books and we'll discuss these when we talk about implementing the marketing plan. For now, join Goodreads and start using it for your personal library. Ask book reviewers to post reviews here as well as Amazon. Even though Amazon owns Goodreads, they are still treating them as separate organizations. Goodreads provides an easy way to promote your books with giveaways. You might also want to start making friends and joining some of the many groups there, especially friends and groups in your target audience. Amazon purchased Goodreads in March 2013. While we are discussing selling yourself, take time to decide whether you plan to review books or not. When I first got started in the business, I read a book about getting the most out of Amazon and the author recommended reviewing books like my own to help build name awareness. I did that, but I have since decided the author was talking about nonfiction books only. I'm not sure there is a benefit for fiction authors to review books other than trading reviews with other authors to increase review count. As an author of nonfiction, reviewing books in the same category may make you look more creditable. Good reviews can show you know the subject and you know how to communicate. However, reviewing your competitor's books could be a problem. You either end up helping them or coming across like sour grapes. There is a discussion in the implementing the plan section about how to get reviews. For now, all you need to do is decide whether you want to do reviews or not. Another way to sell yourself is to get recognized in some way. There are writing contests for unfinished books as well as those already published. When I was writing my first book, Where Love Once Lived, I entered many contests. At that time, I thought it was a romance. I joined Romance Writers of America and learned there was a contest going on somewhere in the United States most of the year. I also learned entering contests was an excellent way to get feedback. Some of the suggestions made by contest judges ended up in the final book. In addition to grammar corrections and suggestions for descriptions, one judge warned me against including an abortion in the story, so I changed it to a miscarriage. There was a charge for these contests, and back then, more effort and expense to copy and mail the manuscripts. Today, you can submit your writing electronically, but many contests still charge a fee. To my surprise, I ended up winning several contests and placing in others. This helped validate my writing, and, I suspect, caused more agents and publishers to evaluate my work more closely. Each win got me closer to finding a publisher, but I eventually published the book myself. When you look for contests to enter, evaluate the cost vs. benefit. There are some organizations that make money holding contests. There are others who I believe simply sell awards. That is, you pay, everyone wins. These types of awards are not the ones that will help you to sell yourself. When looking at ways to sell yourself, another consideration is whether to emphasize yourself or your books. I see some people have a Facebook author page for each book. My feeling is that you should sell yourself by grouping similar books. I have published mostly Christian fiction, so my audience is the same for each book. However, if I decide to publish a book for authors on how to market books, I will have a different audience and may need to brand by book rather than name. I had three book signing events last month. I have one scheduled for each of the next four months and will be looking for additional venues where I can sell books during that time as well. After that, I will be traveling some. But, even while vacationing, I look for ways to peddle my books. For example, we will be in Hilton Head for a week in September so I'm looking for places there. Last year when we were there I learned the two bookstores had closed. This time, I will look for other retail stores. 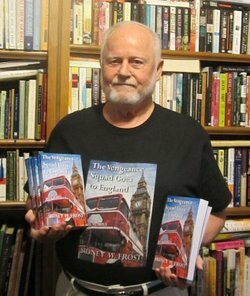 Before they went out of business, I did several book signings at the local bookstore in Georgetown. The first time I was there, I bought a nice ad in the local paper to announce the event. I sold 18 books and the bookstore owner was thrilled. We had agreed on a 60/40 split. I provided the books. She sold the books for full price plus sales tax and I got 60 percent of the selling price for each book. The only problem was the ad cost was about $200 and my income for the books was $172. After six years of experience, I've learned to use advertising carefully. However, I learned also that ads a provide may provide future sales. Only recently, I had a call from someone wanting me to talk to a group and sell books afterwards. I learned they called because they saw an ad I'd posted in the local paper announcing another book signing. I agreed to talk and sold 14 books. There are many places to consider when scheduling book signings. In the past, and perhaps still for some known authors, the ideal place for such events was at bookstores. I've done that a few times. However, there are no bookstores where I live and I haven't considered those in nearby Austin, Texas recently. When my first book came out in 2010, I held a book signing in the largest independent bookstore in Austin, Bookpeople. Only once. At that time, the fee for a book signing was $200. It is probably more now. Even at that I had to wait until they had another author to share the time slot with me. It turned out our target readers were about as far apart as possible. Some of my friends who were there were shocked by what the other author was selling. So, you can set up book signing events at book stores and personal appearances. Usually, at the personal appearance, you will be expected to give a talk first. Many want to know how to write a book and get it published. At my last two talks, I told how to convert personal experiences into novels. Another venue for book signings is any retail business. I've been using a local market that is connected to a restaurant. I've also done book signings at pharmacies. These places usually charge a fee. The market, for example, charges $30 for a three-hour slot. They provide a table and that’s about all. What I've done is work with two friends and we each pay $10. This makes it easier to make a profit. Choose people to share the table with you who have similar target readers. In my case, I team up with my two critique partners. I know their books because I've read them. If one person wants to take a break, the other two can sell the person's books. We all help promote the event by inviting our friends on. I have put an ad in the local paper for some of these shared events, but not all. The market is good because people come and go all the time we are there. It is located near the center of the town and we pick the one Saturday of the month when there are activities going on that will draw a larger audience. We alternate times, 10 to 1 or 12 to 3. The market closes at 3. Selling in this way allows us to adjust the price of the books. My books sell for $12.95. For these events, I changed the price to $9.24. That may seem odd. However, I must collect sales tax which is 8.25 percent. In this case, the tax is 76 cents which makes the total exactly $10.00. This makes it easier to make change. We use a common bank and accept cash, credit cards, and checks. Customers can select books from more than one of us and pay for all purchases together. They seem to enjoy that. I have recently started selling Kindle edition claim codes. I must buy them first from Amazon, then prepare a printed claim certificate to sell. I have sold five, four at one event and one at another, so it is too early to see how well this will work. Watch for more about this approach to selling. Chris McCowan believed his wife Angela had been abducted, but he had no way of being sure. She was an MI6 agent and routinely didn't check in with him for weeks. His intuition told him something was different this time. He was an American computer scientist living in Angela's home in Bath, England. He worked on cyber security for the FBI, and he'd had investigated missing people before. While illegally analyzing FBI computer communications with MI6, he found a reference to an agent missing and per the faintly encrypted description, the missing person could only be Angela. What to do? She'd made him promise to never go looking for her if she was missing. A promise he couldn't keep. Chris activated the Vengeance Squad. Tex, one of his students who understood the seedier side of the world and Liz, the retired librarian who could find the resources needed to carry out a search anywhere in the world. They'd worked together before and had successfully completed the missions. A clue that takes them to a refugee camp in Berlin where they are joined by Heinz, a German translator. Liz's financial backers provide a bookmobile outfitted with the latest technology to help find Angela. When they finally find her, they must convince her to leave her captors. You may unsubscribe through MailChimp at any time. You will receive emails every two weeks or longer, never more frequently. Each email you receive will offer something of value for you such as notice of a discount, a giveaway, etc. Sign Up Now for a chance to win a FREE Kindle edition of Where Love Once Lived by Sidney W. Frost. Note: The first 100 who subscribe below will receive the book as a gift on Amazon. This book is a prize winner and has been an Amazon bestseller in Christian Romance on several occasions. Read about it here: http://amzn.to/1RTEJ2P. My friend and critique partner D.A. Featherling thinks my favorite book, Love Lives On, isn't selling because of the title. I'll send a free Kindle edition to anyone who will read it and suggest a title. If your title suggestion is selected, I'll send you a free paperback of the book with its new title and your name added to the acknowledgements. To get your free copy of Love Lives On, signup on the right side of the screen to follow this blog. D.A. suggested Shadows From Her Past, so you can't use that one. If you'd rather buy your own, click on one of the links below. I was fascinated with how Karen and Brian's "love" turned out. The story kept me interested from the beginning. I am reading Where Love Once Lived right now. It is just as good! I would definitely recommend this author. The story was very easy reading. It had a few twists and turns that made me not want to put it down. I read it in me day. I had to see what would happen next. Great book. Nice story. Liked the Christian theme. Choppy in many places but overall an interesting story. I had a hard time identifying with Brian, and what his life might have been like before and how he earned his money. Loved the book mobile idea! I have read all three of Mr. Frost's books and enjoyed them all. What I liked best was that they and 'Love Lives On; were easy reading and they were clean in language. I hope he has more of the same come out. I enjoyed the mystery of this book and the way the daughter accepted the parent as her own. It showed how God works everything out in your life if you put him first and try to do his will. I will read the other books by Sidney W. Frost. The book is written about people of faith and way they were tested. The book shows how prayer blended them though people were trying to hurt them. Really good story, I enjoyed it greatly, would like to read more by this author. The other reviews have done justice to sharing the themes and plots. I just finished reading this book today and felt compelled to give my opinion. 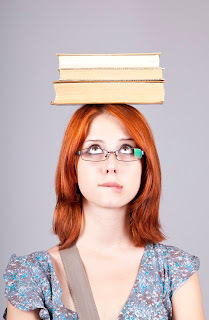 It is well done at every level that a book needs to earn five stars: plot, character development, pace, editing, etc. If you are a fan of Christian fiction, this needs to be in your library. Bravo again, Mr. Frost. Keep 'em coming. I hadn't read the first book and started reading this one without knowing it was a sequel. The characters develop and you care about them fairly quickly. It has enough information that you understand most of the book fairly well without reading the other book. I didn't love it, but I certainly liked it. Well written and well thought out. it was a pleasant read and something to relax to after a long day. Check it out! Love Lives On by Sidney W. Frost is an excellent book to read which I could not put down. This Christian novel is full of intrigue and mystery with a little biblical life lessons mixed in. The author did an excellent job of developing a storyline that was both believable and real. It was easy to follow the story even with all the exciting twist and turns. I really got into the story and identified with the help faith provide. Sidney W. Frost made his characters in this book very real and easy to identify with. I love when I can put myself into a story and follow the characters as they move along. I also liked the way Sidney wove biblical truths into the story without being over-bearing with them. He showed how faith carried this newlywed couple through their trails. I really enjoyed Love Lives On by Sidney W. Frost and I highly recommend this book to all readers. Karen Williams and Brian Donelson finally stand before friends and family to tie the knot, a step that was missed earlier in life. The ceremony is barely over when Karen is served with a notice that she is being sued. Further secrets barge into the lives of the happy couple forcing them to evaluate their decision to wed.
Love Lives On is the third book written by Sid Frost that introduces us to the Vengeance Squad, a group of people who help research information to solve problems in the lives of the people who hire them. Karen and Brian seek their help in discovering the answers they need so they can get on with their life together. I love the characters in Frost's books. they are believable, vulnerable, and strong faith walkers. The story spins and weaves, drawing readers in. It's a great read, entertaining, and thought provoking. This excellent novel certainly starts with a bang - 54-year-old divorcee Karen is getting married to her former college sweetheart. Suddenly a process server arrives on the scene and hands her an envelope. Someone is suing her. This book is part thriller, part romance. It is also a book about two flawed souls, and about the grace of a mighty God working in their lives. The author draws readers into the action with richly drawn characters, fine writing and a fast-paced story. I have read and enjoyed Sid Frost's previous novels, and have no hesitation in also recommending this one. This book is a sequel to the book Where Love Once Lived. It has come out in time for all of those who are looking for another book to add to their summer reading list. I don't want to give the story away so I will do my best to list the ingredients and let the reader decide if it is their kind of read. This is a story about Liz and Brian. They were in love when they were young. The story that comes before this one tells of their separation and eventual reunion. This one starts where the other leaves off. Liz and Brian are on their wedding day. It is supposed to be a day of joy and love and happiness and a court summons....what? That's what Liz receives on her wedding day. She is being sued by a woman she never met for child support for a child she never bore or reared. Needless to say, this puts a damper on wedding romance. This is a nice short story, involving real people with real problems. How do they cope? How do they work together? Is God involved in our lives at all? Can we trust Him to see us through every problem? These are questions that Liz and Brian learn to answer. 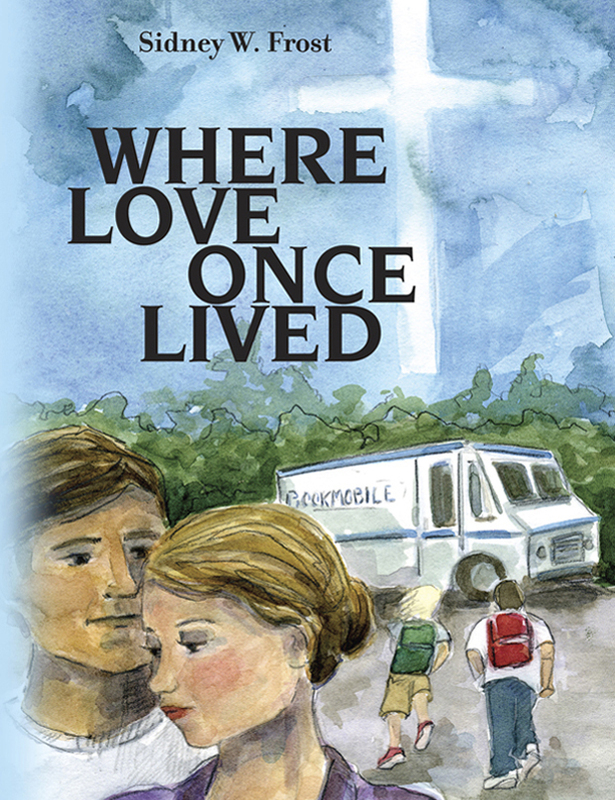 In "Love Lives On", the second in the Christian Bookmobiles series, Sidney W. Frost continues to develop the story of star-crossed lovers Brian Donelson and Karen Williams introduced in "Where Love Once Lived". Problems arise in the opening pages at Brian and Karen's wedding. An unexpected lawsuit awakens unhappy memories in Karen's past, and dealing with it causes conflict in their new marriage. A mysterious photographer trails them on their honeymoon; the driver of a black pickup terrorizes Karen. The suspense continues to build to a satisfying climax. Frost has the knack of moving the plot along with both mysterious and humorous incidents. His characters leap from the pages as real people with distinct personalities. Brian and Karen, two intelligent, loving, devoutly Christian, yet flawed individuals, have the maddening propensity for failing to share vital information in a professed effort to "protect" each other. Brian must come to accept Karen's desire to be independent, to follow her sense of what God is telling her. Members of the Combine and Liz, the lovable librarian, are back, along with Liz's team from Frost's "The Vengeance Squad." 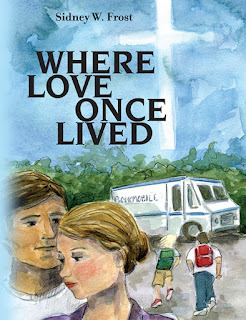 Though written as a sequel, "Love Lives On" stands alone as a thoroughly entertaining read. I loved this book! What a fun combination to put romance and thriller together! The romance part was very sweet. I thought Sid did a wonderful job of dealing with the real-life reactions and issues a couple in their "mature years" would encounter--aging parents, children on their own, crazy ex-partners all while trying to have a honeymoon! He skillfully helps the reader feel the tension of the main characters as they put their college romance back together after a 30-year separation. A separation that was unnecessary if they had only talked to each other at the time! You worry with them over things not said that should have been--an old pattern they both want not to follow them into this relationship. You feel the angst of trying to protect each other. Both main characters are aware of their knee jerk reactions and the effects on the other and yet, it still happens. Sid effortlessly weaves their faith into the dialogue so that it adds to the overall story. I appreciated that forgiveness, kindness, thoughtfulness and faith was consistent throughout their daily lives; it wasn't just a Sunday thing or turned to only in an emergency. The thriller part? It kept me coming back. :) Just when you think life is going to settle and they can major on the romance another curve ball! And isn't that life? You can't leave Karen hanging upside down in her seatbelt! You have to know how all this crazy stalking ends so these people can have their honeymoon! The writing -- It is a good writer who can put you in his characters' shoes so that you feel their experiences! The action kept going. Secondary characters received adequate development so that you felt you knew them as well, and maybe even understood them in a way. I didn't feel the story line ever went flat and the editing was excellent. You pulled for the good guys and wanted to put the bad guys away! A nice ending leaves you wondering if there is one more coming. It's an excellent read for those who like thrillers, or romance or both! I will be recommending Sid as an author. Everything he has written has been well done. I give it 5 stars! Although this book is clearly a continuation of Frost's earlier Where Love Once Lived and brings back some characters from The Vengeance Squad it is a fully complete standalone novel. In the first few episodes of Love Lives On the story itself quickly and thoroughly introduces main characters, establishes the setting and sets the tone and pace (fast) for the novel. But, for anyone who enjoyed the first two this new one will be an absolute delight. To avoid giving anything away I'm not going to comment on the plot's twists, turns and surprises but I do want to observe that the writing is solid throughout and the dialogs are exceptionally effective. Character's fears, aspirations, intentions, attractions and feelings are often revealed by what the characters do and say. Rarely does the narrator tell us what the actors motivations or expectations are. In general, the verbal interactions are natural, believable and totally in character. A consequence of this is a tendency for the reader to forget they are reading and to just absorb the story. Speaking as a reader that is great fun. You'll want to read both novels Where Love Once Lived and Love Lives on. Though both books can be read alone, if you're like me, you'll want to know more about what happens to the characters. I love series. You first meet Karen in Where Love Once Lived along with other characters who show up in Love Lives on as friends who help her in her time of need. Love Lives On evoked emotions and made me laugh and cry at times. About midway, I didn't want to stop reading because I wanted to see what happened, and I had to make myself put down the book and go to bed with only five remaining chapters, which I quickly finished at my next opportunity. Karen's life becomes endangered and so do others as they try to help her, especially her friend, Cathy. I loved the way the ending wove together for a surprise with forgiveness and God's purpose, as Karen insisted on discovering. While she could have chosen to throw money at problems to make them disappear as her new husband Brian offered to do more than once, she refused to do so because she wanted to know the whys and God's purpose. Why did God allow her to be sued? What possible good could come out of it? I won't include spoilers, but I'll just say that much good overcame evil. I also loved how the author illustrated how easy it sometimes is to con trusting or vulnerable women. There's more than one surprise in this work of art. There is foreshadowing along the way. This novel takes you on an adventure and a journey. I've never read one about Germany, a place I've never been. I found the places visited on their honeymoon interesting. To describe Love Lives on in a sentence, I'd say Love Lives on is a novel of love, learning to trust, and forgiveness. The ending was touching, and I loved it. There are some page-turning exciting incidents along the way as well. Grab both reads and enjoy them as I did. A sequel to Where Love Once Lived was highly anticipated by me. Being curious as I am, I simply had to know what would be happening in the characters' lives. Love Lives On answered the questions in my mind, with humor, a bit of romance and much mystery. Sidney blended the stories and characters into an exciting novel. The occurrences in Love Lives On are very "real to life", and I am sure most readers will find themselves somewhere in the book; most could happen to anyone in one form or another. Yet, the manner which Sidney wrote this story, had me sitting on the "edge of my chair" at times. The characters blended so well; some the reader will like, dislike or plain "yell out loud" at the nasty things they may do or say. Love Lives On brings hope, love, forgiveness and faith to the reader. I highly recommend this book, and anticipate the continuing adventure of Karen and Brian in the next novel. What I love about Sid's work is that he explores relationships between older people. How do those of us experience life from the point of having "been there and done that"? We approach life with certain expectations and experiences, and when we embark on a new relationship, how do we meld what we are with another person? And when crises hit, as they inevitably do, how do we chose to allow our spouse to help us, or can we learn to respond in a new way? Love Lives On pulls together characters from Sid's other series to help Karen and Brian when she's sued in an emotionally and financially-draining frivolous lawsuit immediately after the wedding ceremony. Karen and Brian must figure out how to work together when aspects of the lawsuit become threatening to their physical welfare, as well as when an unexpected health crisis strikes Brian's family. I loved their honeymoon in Europe - I felt like I was there with them. Sid allows both Karen and Brian to tell the story from their perspectives. There's drama, there's romance, there's barbecue, there's danger and excitement...what's not to love? Sid's story-telling comes from his personal experiences which he lovingly transfers to his characters. Karen and Brian are real people who learn to rely on each other besides the God whom they both trust. Don't we all want a piece of that? "My reading had pretty much been confined to books about investing, computers, or medical science. That all changed when I learned about the books written by Sid Frost. I have just completed reading his most recent work "Love Lives On". The story is quite interesting and I really enjoy the way that he uses real places from the Austin area and his use of characters that we have gotten to know from his previous books. The mystery and surprises keep coming, right up to the final page."